I reveal my favourite essential oils for relaxing and general family life - let me know which you love! This post contains some affiliate links. This means that if you decide to click on them and make a purchase, I may receive a small commission, at no extra cost to you, that goes back into helping me keep this blog running. Thanks for your support. Do you like using essential oils? I was lucky enough to have taken part in a short study recently, where we monitored the effects of some essential oils for anxiety and stress, and reported back whether they made us feel different. In short, they did. But then I've always been a fan of these aromatic oils. Here are my favourite oils that I like to use with myself and my family. My all-time favourite oil, EVER. So relaxing. I add a drop to my diffuser and leave it on sometimes all day, if I'm having a bit of a stress. I also add a couple of drops to the perfumed pads (the scent now long gone) inside my hoover so my house smells all lavender-like when I clean. My friend Jules mixed me up a lotion including doTerra lavender oil for my scalp psoriasis and it did seem to calm it down. The only problem? I can't grow real lavender. We moved into our house and there were two great big lavender bushes. Within a few months they died. When I replaced them, they died too. I've given up. I'm no gardener. But lavender, I love you. Imagine you could take the smell of the most ripe, aromatic orange and put it into a bottle. Well that's what orange oil smells like. My 9-year old daughter LOVES it. She keeps a little pot of it next to her bed to help her if she's ever feeling tired or just craves the smell. It seems to perk me up too if I'm feeling groggy or tired, so I keep it on my desk in the daytime to get me through that afternoon slump. It's also thought to help lift your spirits if you're prone to feeling low. And it smells as if you're walking through abundant orange groves, somewhere warm. We love it. Just something about the smell of Frankincense relaxes me. It's somehow exotic, a bit spicy, woody and sweet. My husband loves it too. It goes in my diffuser, sometimes mixed with a few drops of lavender oil, and makes the house smell amazing. And it seems to lift the mood of anyone who comes into the house. I've also noticed that Frankincense seems to be used in some of my vegan skincare products. As part of the study that I mentioned above, I was given a small pot of doTerra's Balance oil. The people leading the study suggested massaging a few drops on the soles of my feet before bed to help sleep and combat anxiety. It turned into a routine that lasted as long as the oil did. And now I'm saving up for some more. It smells really woody and settling - with the aromas of spruce, ho wood, frankincense, blue tansy and blue camomile. I kept a bottle of tea tree oil in our bathroom ever since one of the girls came home from school with head lice and it was suggested that I massage some of this into her scalp, because apparently the little critters don't like it. We combed them out and used the tea tree oil for a few days and they didn't return. Thank goodness. I also add a few drops to my shampoo and it seems to calm down my scalp psoriasis a little bit and reduces the itch. It also smells so fresh and pine-like and leaves a soothing coolness on my skin. 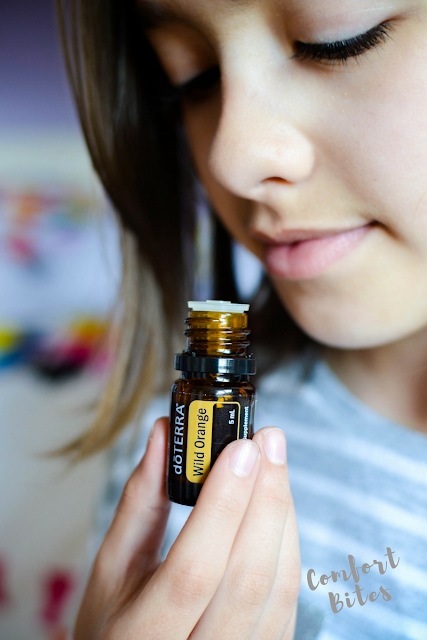 Quick note: As we're all different, it's a good idea to get advice before using essential oils, especially if you plan to use them on your body. And always read the advice on the pack before using. What are your favourite essential oils? Let me know in the comments below!